Select the "Enter Data For Athlete" button displayed in the image above. All of the forms that you have access to, and any new forms that your sport/organisation monitor will all be available using the "Enter Data For Athlete" button on the Home Page. 1. Once you click "Enter Data" you will be shown all of the forms you have access to (they will be different from those in the Image here). 2. The Underlined Blue links show the groups of forms that are available. 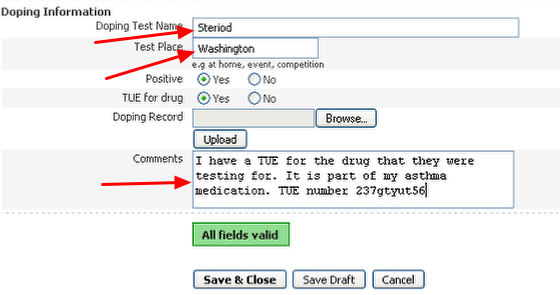 For example, if you selected Testing all of the "Fitness Testing" data entry forms would be shown. 3. You can also select to be shown a subgroup of forms. The example here shows that the "Jumping" Link from the Testing forms has been selected which shows all of the jumping Fitness Testing Forms. 4. The example shows that of the two jump fitness testing forms, you could select either the 30s End Jump and the One-step Vertical Jump Test. Once you select to complete a specific type of form/event, the exact form will appear for you to enter your information into. The system is designed to be easy to enter information into and each question is designed to capture specific information. Points a-g below shows you how to enter different types of information into the system. You MUST set the date and time that you want the entry to be saved under. 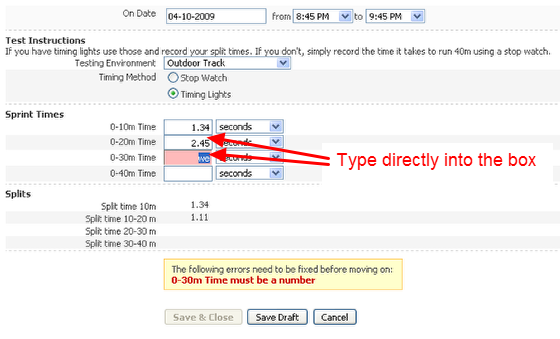 ALL records are stored using the date and time selector shown here. It will default to the date and time that you enter the record. #2 Select the time the events will start. Click in the "from" drop down box and scroll through the time using the scroll bar in the drop down box (or start to type in the correct time) and then click on the correct time. The "to" time will then change to be an hour later than the "from" time. 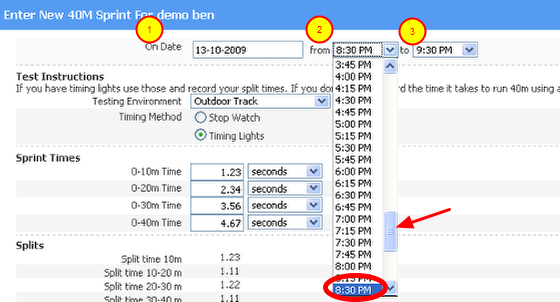 To change this, simply click in the "to" drop down and select the correct time that the event will finish. 1. If you completed a test/event 1-2 days ago, you will need to select the correct date and time that the event happened, otherwise the information will be stored on the day that you are entering the information. 2. You want to plan a session for the future. You will need to select the correct date and time that you want the event to be scheduled for, otherwise it will be stored on the wrong date. On the right hand side of the data entry page, if any previous information has been entered for that event, then the system will automatically show this data. It will also calculate the difference between the new information and the most recent entry and show you the actual difference and the % difference. The image here show that the last 40m sprint was performed on the 11-02-09, and while the athlete was slower on the 0-10m split (shown by a red arrow), he has improved his time (shown by green arrows) on all of the other measures. This feature instantly shows you how the athlete is progressing, without even leaving the data entry page. This feature may or many not be enabled for you by your administrator. All of the events have been built to capture specific information. The image above shows that the 40m sprint form can only record numbers. To complete a number box, simply type in the correct number. In this form you can instantly see that the time needs to be recorded in seconds. If you enter in text into a numeric field e.g. the 0-30m numeric field, the box will turn red and the "save and close "button will be hidden. This prevents users from making mistakes, and ensures you enter the correct information into the system. To fix this issue, simply delete the typing, wait a couple of seconds and then type in a number. Drop down box: Drop down boxes have the blue arrow that you need to click. Then you select form a list of possible choices. 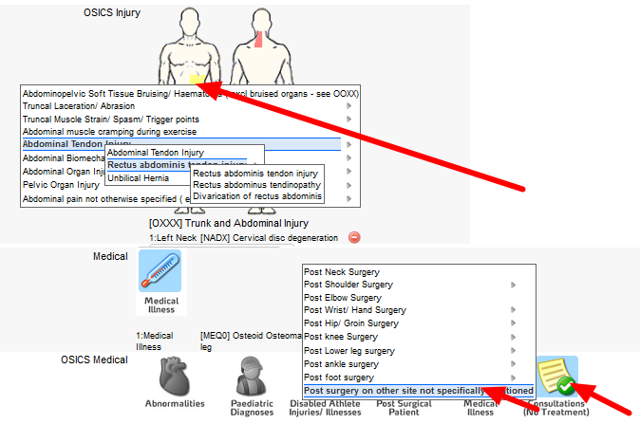 The image above shows that Severity needs to be rated, so the users selects the blue drop down icon (Circled) and then the list of available choices appears. Click on the most appropriate response and that will be saved e.g. Grade 1. Single Selection: for a single selection question (partly obscured in the image above), you will only be able to select ONE answer. Simply click in the correct circular tick box beside the most appropriate response. The image above shows that "Unable to Train" has been selected from the list of possible responses for the "Able to Train/Play" question. Multiple Selection: A multiple selection question will have square selection boxes (instead of the circular ones that a single selection has). For a multiple selection question you will be able to select multiple responses. A single line of text or a text box allow you to enter ANY type of information and no errors or selection boxes appear at all. The arrows above highlight the different sized text boxes that are used in the drug testing form. Numbers and text has been entered. A text area/line allows you to enter any type of information. Other question fields such as databases, or large drop down boxes look like text areas. However, when you start to type in your response, possible selections appear for you to select ( see section f. Databases below). Some injury, illness or overtraining forms may show a body image like the one in this image. The easily allows athletes and professionals to visualise where an injury or issue is occurring. To enter simply mouse over the body and different areas will be highlighted in yellow (#1). Click on the area that is injured, the body area it will turn red(#2) and a description of the area will be recorded (Left thigh has been selected). Click "Remove" to remove this selected body area and select a different area. 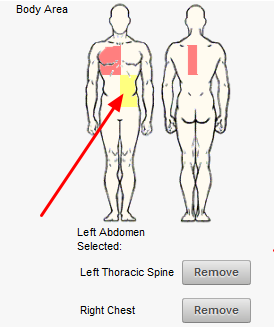 If your body Diagram has a list of injury codes that appears when you click on a area, simply scroll down the selection and navigate through to the correct area/diagnosis. The correct Orchard Code will be displayed and will be recorded for that athlete. A question can be linked to a database of records. Databases are used most commonly to store a lot of records about a specific question, e.g. exercises for resistance training, or medications, or even different competition event names. The image above shows a database of exercises is included in a resistance training form, so that users can select an appropriate exercise. To choose a database record from a database question, simply start typing the name of the record that you want and any database records that match that name will appear. The image shows that dead lift has been typed into the text area, and all matches are appearing to select from. Simply click on the database record that you want and it will appear. Any table that you need to enter data into may be made up of any kind of question (single selection, drop down, text box, number, database). When you enter data into a table, simply click in the first cell of the table. A pop up box appears allowing you to enter data for that specific cell. Because you are entering data on-line it works slightly differently that an excel spreadsheet, so you need to work from one cell to the next. Simply enter your information and click Done. To speed up data entry, the system will automatically take you to the next cell to enter your information. If you select in the "copy entire rows", this will copy all of the information in the entire row, and overwrite any existing data. Use this option only when you need to have the same type of data going into all rows (not just one column!!). Paste from Excel- Paste allows you to copy in data from an excel spreadsheet, as long as it is formatted in exactly the same format as the table columns. Click Paste and a blank pop up box appears. Copy the information from an excel spreadsheet directly into this window and click "Insert Values". "Save and Close", or "Save and Enter another", or "Save Draft"
Complete your information and click "Save and Close"
Complete all of the questions in your data entry form and when you have finished click "Save and Close". You will then be taken directly to that Athlete's History page. This displays the new entry against any other records for that type of event. Then you can easily compare this new record and see how the athlete is progressing. For more information on the History page, see the "My History" in the help manual. Click the "Save Draft" if the information that you entered is NOT completed and you want to go back into it later. You click Save Draft to show that a future event is saved as a draft, e.g. a training session that an athlete needs to complete later on in the week. For more information on Drafts, see the "Draft" and Planned data section in the help manual. To enter additional information, you may have access to a "Save and enter another" button at the bottom of the page. This allows you to save the information you have just entered, and then select a different event to enter new information into the system. Click Save and Enter Another, and you simply select a different event/form, and the appropriate athlete that you want to enter the new information for. Alternatively, go back to the Home Page and select "Enter Data". Then, follow the steps outlined in this section. If you do not want to save the form or the information click "Cancel" ( displayed in the Image above). After you select Cancel you will be asked if you are "Sure you want to lose all changes". Select " Yes" if you want to delete the entry. Select "Cancel" if you want to go back to the form to continue to edit it. When you have finished changing the form select Save and Close. Save and lock will lock the record so that no additional information can be entered into the system. After you select Save and lock a 24 hour time delay will follow so that you edit that record 24 hours after you select "Save and Lock". Others are locked instantly. This is important for medical data especially. What happens to the information that you just entered? As soon as you select "Save and Close", "Save Draft", or "Save and Enter another" , and you are working online the information will be stored on your central servers and the athlete and any other professional who has clearance to see the data will be able to access this information. If you are working off-line the data will be stored on your computer and the next time you login online the data will be automatically synchronised and will be available to others with access.